Trewithen gardener, Neil Trebilcock, had a bit of a shock when he went inside for a quiet lunch break last week. 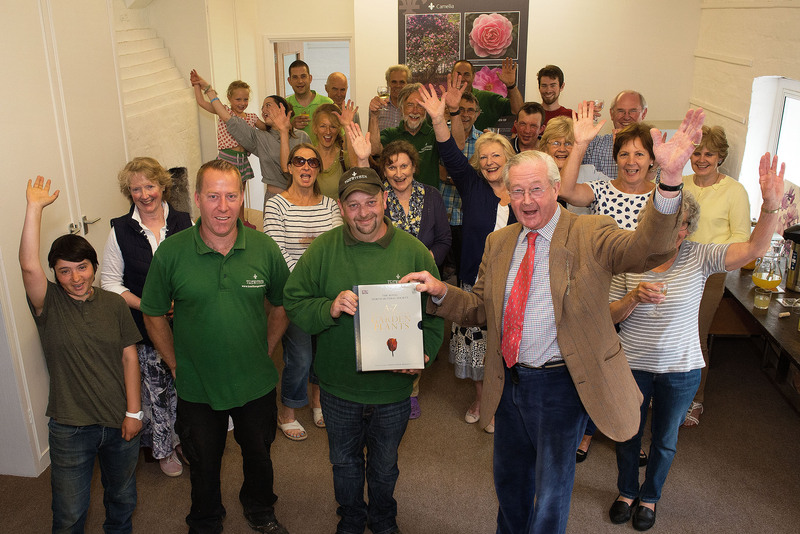 Around 20 members of staff and the Galsworthy family were gathered with pasties and presents to celebrate his 25th anniversary working at Trewithen. He was hired by former head gardener, Michael Taylor, who asked Neil’s dad, Ron, who worked at the estate farm, to send Neil to see him and he’s worked here ever since. As a teenager, Neil was introduced to the pleasures of gardening by his father. Together they grew vegetables, mainly shallots, carrots and onions, to enter in local shows. It was a hobby they enjoyed and they won an average of 20 trophies a year. Neil still has an allotment and spends his leisure time producing huge carrots and parsnips using special techniques to ensure long straight growth. He has over 1000 prize cards and a large box of medals to mark his success. Gary Long, who took the position of Head Gardener at Trewithen when Michael Taylor retired, described Neil as a bit of a genius when it comes to show displays. Neil is now looking forward to celebrating 50 years at Trewithen.